Just got back from cleaning 3 carpets for Mr M. in Oakham. Whilst relatively straight forward for us to clean and to get great results each of the carpets had a different staining issue. One had food stains from a pet cat that ate its dinner in the room but preferred eating from the carpet as opposed to from its feed bowl. This had lead to numerous small stains. Using Solutions M-Power, a unique eco-friendly cleaning solution , that works using a colloidal action, slowly breaking down the soiling, we were able to totally rid the carpets of any marking whatsoever after rinsing out the solution with plain water. The second carpet has signs of soiling around where the sofas were from Mr. N . sometimes forgetting to take off his boots after work. Now this particular carpet , as indeed are most sold on the domestic market today, was make of polypropylyne, a manmade fibre that has many attributes to recommend it as a carpet fibre, but a weakness is that unlike wool it has little ability to spring back once flattened. The reason for this is that once crushed the fibre remains bent over. 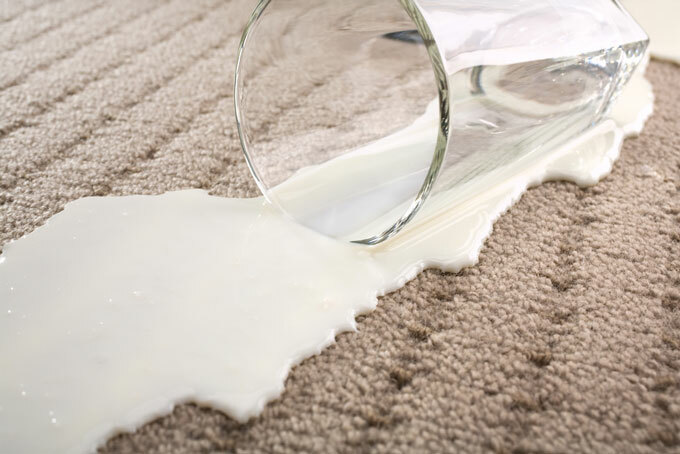 This means that the bent over fibres reflect light at a different rate to the undamaged upstanding fibres and this normally presents itself as a dull or even soiled looking area of carpet even when it is clean. In this case we got the carpet clean and the damaged area was barely visible once we had lifted up the pile. The final carpet was in the kitchen area. This had suffered from a number of cooking spills but using a microsplitting cleaner all of these greasy food deposits were removed. For all your carpet cleaning Rutland needs, let The Rutland Cleaning Company get your carpets looking good as new again.